Whether on the ground or in the air, our safaris are equipped to quickly and skillfully position photographers in the best vantage points to capture their dream shots both creatively and safely. 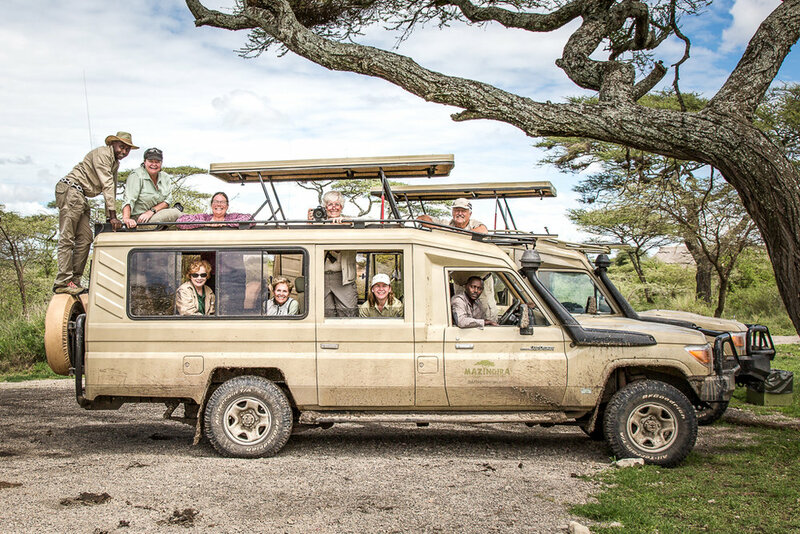 Our small group of six photographers travel in the comfort of two custom-designed 7-seater Landcruisers, three photographers to a vehicle. Each photographer has a row of well-padded seats for themselves and their camera gear, with extra large windows either side and a pop-top roof above. Each safari vehicle has an expert guide/naturalist with the photographer/trainer alternating between vehicles. Both vehicles have a refrigerator stocked with an unlimited supply of bottled water, soft drinks and snacks. Once again we’re offering the option of a hot air balloon safari over the Serengeti with a bird’s-eye-view of the Great Migration from a unique perspective. For another aerial panorama of Tanzania, enjoy the rich and varied landscape by charter flight on the return journey to Kilimanjaro International Airport. The Serengeti. Morning and afternoon game drives. The Serengti. Morning and afternoon game drives. Optional Balloon Safari Central Serengeti. Kogatende, Northern Serengeti. Afternoon game drive. Kogatende. Morning and afternoon game drives. Kogatende. Optional Balloon Safari. Morning and afternoon game drives. Arrive at Kilimanjaro International Airport and transfer to lodge. Tarangire National Park. Late morning and afternnon game drives. Tarangire National Park. Morning and afternoon game drives. Lake Eyasi. Hadzabe Bushmen and Datoga Tribe. Afternoon free. Ngorongoro Crater. Olduvai Gorge. Ndutu off-road game drive. Ndutu and Serengeti National Park. Morning and afternoon game drives. Discover three of the best known, most diverse national parks in Tanzania: Tarangire, Lake Manyara, and the Serengeti. Each park is known for its unique landscape with species of birds and animals endemic to that particular region. TARANGIRE is the sixth largest park in Tanzania. It is home to the largest herds of elephants in the country and over 550 varieties of birds - the most bird species found in a single habitat anywhere in the world. LAKE MANYARA NATIONAL PARK stretches along the base of the Rift Valley escarpment and is world famous for its tree-climbing lions, blue monkeys and the world’s largest concentration of baboons. More than 400 species of birds are found in the park as well, including large flocks of flamingos. The Serengeti has all of that and everything else!! Established as a national park in 1951, The Serengeti is Tanzania’s oldest park, a World Heritage site and was recently proclaimed a 7th Wonder of the World. It encompasses 5,700 sq miles (14,763 sq km), stretching north to Kenya, and borders Lake Victoria to the west. Best known for its annual migration when six million hooves pound the savannah in search of greener pastures, the park has a healthy stock of other resident wildlife – in particular, the Big Five (Maasai Lion, African Leopard, African Bush Elephant, Eastern Black Rhino, African Buffalo). — Anand & Sheila K.
The roughly 100 square mile (260 sq km ) Ngorongoro Crater basin is home to an estimated 26,000 mammals and provides us with the best opportunity of seeing one of the crater’s 26 Black Rhino. 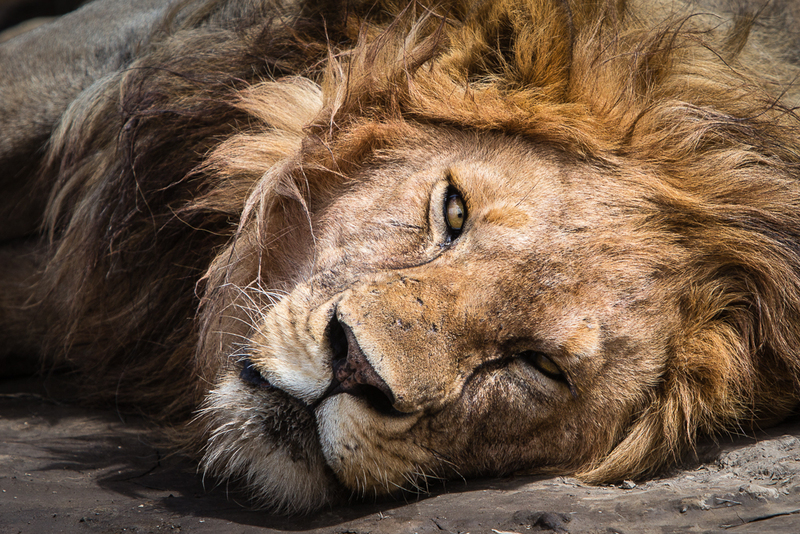 In addition there are elephants, wildebeests, zebras, eland, both Grant and Thomson gazelles, reedbuck, Cape buffalo, spotted hyenas, jackals, wild dogs, cheetahs and the densest known population of lions. The Cradle of Mankind, an ongoing archeological dig with a modern museum of relics and artifacts dating back 1.75 million years. The Great Migration is on every passionate photographer’s Bucket List. The sheer magnitude and excitement of this spectacle, as 1-1/2 million wildebeest, zebras and gazelles plow through the crocodile-infested Mara River in search of greener pastures, is not only visually overwhelming but a photographer’s feast. Prepare for four days on the Mara at the peak time for crossing, ensuring our group the best chances of multiple crossings and maximum photo opportunities. The 'Mara' need no introduction, being one of the best-known wildlife reserves in the world and on every serious photographer's 'Bucket List'. Contiguous with Tanzania's Serengeti National Park, the Maasai Mara shares the annual Great Migration spectacular as 1-1/2 million wildebeest, zebra and Thomson's gazelle migrate between the two countries. Exceptional for lions, leopards and cheetahs. After the Maasai Mara, the Amboseli is the second most visited park in Kenya. It's one of the best wildlife viewing experiences in the world with over 400 species of birds (including 47 types of raptor). It's considered the best place in the world to get close to free-ranging elephants. And with Mount Kilimanjaro as a backdrop, what more could a photographer want?! What better way to acclimate to the time zone pre-safari or unwind post-safari than basking in the African sun on the beaches of Zanzibar? The island archipelago has a long and colorful history involving the Persians, Arabs, Indians, Chinese, Portuguese and British. Besides the pristine beaches, Zanzibar is best known for the role it played as a staging port in the international slave trade, and there are many relics remaining throughout the island. It is also the only habitat of the endangered Red Colobus monkey.The capital city, Stone Town, is a World Heritage Site. We know Zanzibar! Let us help you plan an extension to suit your budget. Safari transport is two elongated 7-passenger, custom-fitted Land Cruisers. The group size is limited to six photographers, three to a vehicle, one to a row of seats, providing each photographer with ample space for themselves and their gear, with a supersized opening window either side and the pop-top roof above. Bean bags are provided for camera stabilization. All of our accommodations are carefully selected, not only for their rating of excellence and their safe environment, but for their location in regards to the migration and the other wild game. On some of the safaris we are opting for tented camps – some permanent, some mobile – as these offer us the greatest chance of being in the right place at the right time. The safaris are all-inclusive (including transfers, internal flight, ground transport, guide, driver, accommodation, all meals, well drinks, house beer and wine, all park fees, taxes and gratuities). Not included are the flights between guests’ domicile and Kilimanjaro airport (JRO), the optional balloon safari, and spending money for souvenirs, personal items and incidentals. ALL PRICES QUOTED ARE BASED ON SIX PARTICIPANTS AND DOUBLE-OCCUPANCY. FEWER THAN SIX PARTICIPANTS WILL NECESSITATE A PER PERSON INCREASE IN PRICE. SINGLE SUPPLEMENTS ARE SUBJECT TO AVAILABILITY. PRICING IS GUARANTEED AS DESCRIBED AT THE TIME OF PUBLICATION. PRICE FLUCTUATION CANNOT BE CONTROLLED SPECIFIC TO PARK FEES AND INTERNAL FLIGHTS. ANY DIFFERENCE IN TERMS, IN THE UNLIKELIHOOD THEY SHOULD OCCUR, WILL BE PASSED THROUGH TO THE CLIENT.